You know those recipes that are handwritten by your grandmother, or your aunt, or your Mom? They are faded and have a few splatters on them, they may be creased and are probably in spidery cursive? You may have made them so many times you don’t actually need the recipe, but you pull it out anyway because you like to look at it. This is one of those recipes. This is my grandma’s recipe and it is absolutely stellar. It’s easy and deliciously chocolatey and will make mediocre generic ice cream stellar and will take slow-churned vanilla bean ice cream right over the top. Basically, you should make this right now and keep it in your fridge at all times. Put all dry ingredients in small bowl, stir with fork to combine/sift. Melt butter over medium heart in saucepan. Add milk and turn heat to high, stir with whisk. When it gets hot and smoking add the dry ingredients and stir until it is bubbly. Then stir one minute more and remove from heat. Stir in vanilla. Let cool 5-10 minutes and then eat with a spoon. I mean, spoon on to your ice cream. The longer you let it bubble the thicker it will be. 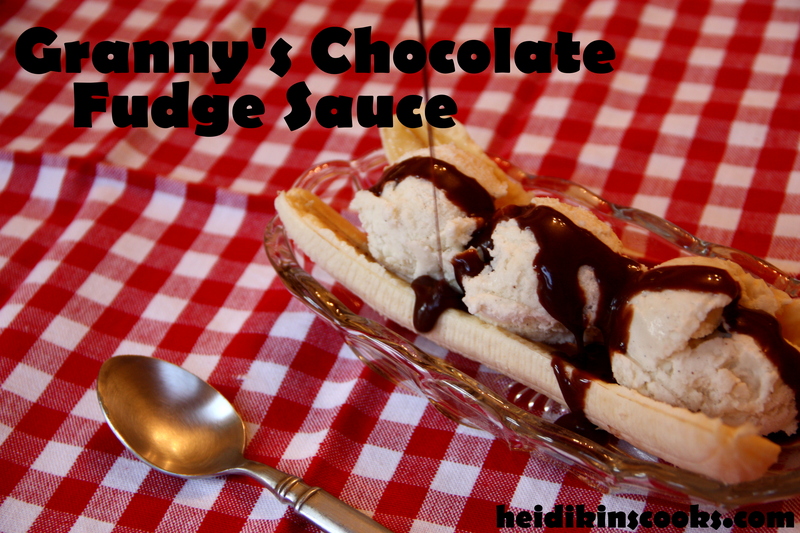 Thick fudge sauce is perfect for eating out of the pan with a spoon, but it’s trickier when you’re trying to put it on a fudge sundae; you have to heat it up pretty hot for it to pour properly and then it melts your ice cream on contact. So, you know, keep that in mind as you’re watching the clock. Half this recipe makes enough sauce for 2 awesome banana splits, or 3 “I’ll just have a little” splits. My great-grandfather was a pharmacist and owed a small drug store where he dispensed pills and potions and made floats and sundaes and lime rickies for anyone who wanted one. He had these lovely banana split dishes that we would always use for our sundaes, no boring bowls for us! I inherited one or two of these dishes and was content to have that small piece of my heritage. However, several years ago I happened to find a lot of about 35 of them at a local thrift store, same pattern as my great-grandfather’s, for 50 cents each. I bought every single one and distributed them amongst my siblings. I think I am now hoarding a set of 8 and insist on having my banana splits in a proper banana split dish. As you do when you have great-grandpa’s dishes and your granny’s chocolate fudge sauce recipe. Hey! Is this recipe from our (Gma D) family? I love your blog, and your cooking taste! Thanks for the yummy hot fudge recipe! No, it’s from Gma C, although I’m sure Gma D would have loved it too, it seems right up her alley.